Overseeing "the studio scene" is a white-turbaned commander who also resembles self-portraits by Rembrandt. 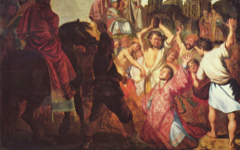 Positioned behind the Crucifixion scene, he seems to both look out of the painting and observe the action. 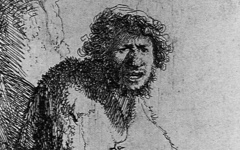 However, as another alter ego of Rembrandt, he is not looking out at us but into the mirror of his own mind. His historically inappropriate turban is also significant because artists often wore turbans in the studio to keep paint off their hair and sometimes, like Jan van Eyck, donned them in their self-portraits too. Rembrandt, Raising of the Cross (c. 1633) Alte Pinakothek, Munich. Keep this understanding in mind when you see other paintings of this subject. Rubens and Tintoretto, for example, constructed their versions of the story on the same basis: studio hands, some in contemporary clothing, struggling to raise the artist's supreme artwork: the artist as Christ crucified. 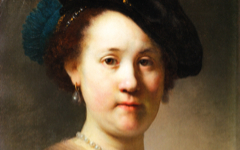 One last observation is that the lighting is central to Rembrandt's meaning. Not only does the light on Christ separate the two levels of reality, the studio and the work of art, but also alludes to the spiritual journey that Christ’s life is a guide for. The spectator’s viewpoint (Rembrandt’s really) beyond the dark of the freshly dug grave suggests that we too must go from the darkness of our current life to the light of the next, once we reach, dead or alive, union with the divine and find the Christ within ourselves. It can be a struggle to get there. First published online in April 2010. Reissued June 2012. 2. 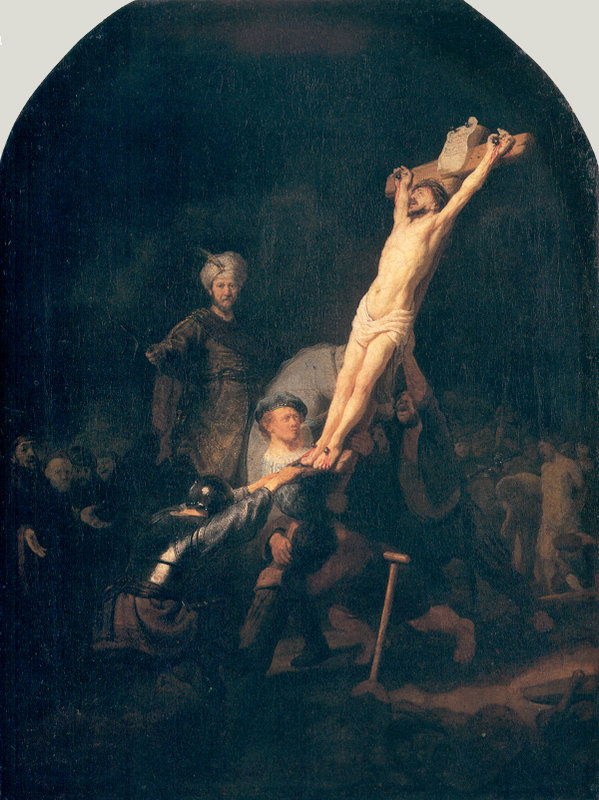 The Crucifixion within the painting might represent a sculpture, an equally good symbol of art, because the scene itself looks so much like workers trying to push a heavy marble piece upright onto its pedestal. It could be that Rembrandt saw mental images of his paintings in 3-dimensions, as some composers have said of their own work. Original Publication Date on EPPH: 28 Jun 2012. © Simon Abrahams. Articles on this site are the copyright of Simon Abrahams. To use copyrighted material in print or other media for purposes beyond 'fair use', you must obtain permission from the copyright owner. Websites may link to this page without permission (please do) but may not reproduce the material on their own site without crediting Simon Abrahams and EPPH.